Thanksgiving is coming up in 1 day. This means that shopping time before December 25 is narrowing for most gifts and it has narrowed even more for imprinted gifts. Never fear, it’s not too late. Food gifts are great and can be turned quickly. One of our favorite items is the annual truck selection. 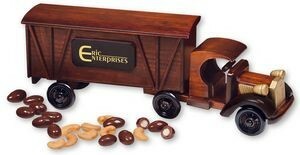 This year the truck is a 1920 Tractor-Trailer with Chocolate Almonds and Jumbo Cashews. It’s a home run if you are in the trucking/transportation business.